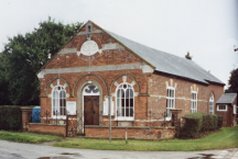 Address: High House Road, Beetley, Dereham, Norfolk. NR20 4BX. will ensure you get a good welcome. A link to the church's own website is here . 11am 2nd & 4th Sunday in month. This is usually an informal fellowship service with a chosen theme, a leader, and members of the congregation taking part if they wish. Traditional Methodist worship supported by friends from a wide area who value an evening service. Refreshments are enjoyed after the service. · Mondays at 7.30pm: Study Group. Members from several churches meet here to discuss church and biblical issues. There are usually two sessions per year, February – June and September – November. Contact John Hull on 01362 695154 for details. · Wednesday (1st & 3rd each month), 2pm till 3pm: Drop In. An informal gathering with refreshments, fund raising for charity and prayer. · Wednesday (4th each month), 2 till 3pm: Knit and Natter. · Bi-Monthly, 9:30 till 11:30am: Coffee Mornings. Cakes, books, bric-a-brac and good company. The Methodist Church wishes to be an environment where all feel welcome and cared for.